My best friend and I arrived in Buenos Aires airport on a hot January afternoon. As a taxi was already waiting for us there we went straight to our hotel, located in Libertador Avenue in the cultural, commercial and financial centre of the city. After settling in and having some rest, we decided to get to know the city that never sleeps. First, we went to a grill room located in Plaza Serrano. We had been told so many times of Argentinian’s tasty meal and of it’s excellent quality that we couldn’t wait to taste it ourselves. And to be honest, words are not good enough to describe it. After desert – we ordered a traditional Flan with dulce de leche, which is highly recommendable for sickly lovers – we continued our night out. My friend, who is a real gossip fan, found out about this show biz guy who had suddenly became rich after his father’s death and who owned the most popular night club, so she suggested we go there. One funny thing about a Buenos Aires night is that parties get started after half past one am and go on and on until six or seven in the morning. However, that first night we were so tired that we had to leave the place by five. The following day, or five hours later, we woke up and, after having an abundant and varied breakfast, we took the bus to Puerto Madero, the fanciest and the newest neighbourhood of the city. The place has it’s own charm: being located by the river it offers a different view to the dikes and an attractive urban landscape. It is no wonder that more and more people choose to live there. In the afternoon, we decided to take a walk down Florida Street (see picture above) and we learnt some history. During the 1880s this street had been the residence for the richest families of Buenos Aires. However, since 1910, due to the growing of commercial activity in Florida Street, the elite area moved to the town which is now known as Barrio Norte and Florida turned into a commercial artery. And, what’s more, in 1913, thanks to storekeepers, the street was made entirely pedestrian in some stretches. Big commercial stores, such as Harrod’s and Gath & Chaves, set up there and also a series of cafés and cake shops, as well as art and literary galleries. Today, if you walk down Florida Street, you will also run into a huge number of peddlers and you may end up enjoying some of the shows of the many artists performing for tips: from mimes to tango shows, including music playing and puppets shows. At night, my friend and I decided to go for something different, so we let the hotel receptionist suggested us a Tango dinner show. Apparently, every tourist who arrives to Buenos Aires for the first time is persuaded to go to one of these and, most of the time, they are all delighted with both the food and the show. The receptionist told us that tango is definitely, the most authentic Argentinian artistic expression. It was born in the late 19th century but it was only at the start of 20th century that the first tango song was sang by Carlos Gardel. 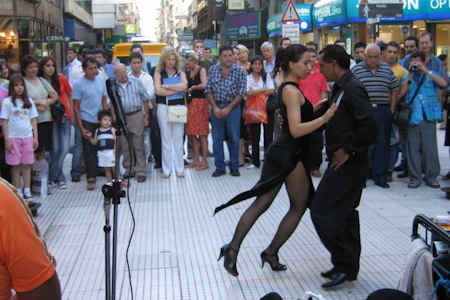 Since then, tango became sort of sad and melancholic, and the citizens of River Plata started to use it to express their pain, anger, nostalgia and morality. Gardel was not only the essential element for its creation but also for its development and he even sang in Paris. Unfortunately, he died in 1935 in an air crash but a myth was born and with it began a period of great compositions and poetic creations, which turned into tango lyrics. The following day, we went on a city tour and we visited many places. The first one was the obelisk, a monument build by the Argentinian architect Alberto Prebisch and unveiled in 1936, which contains in each of its four faces an historical fact of the city: the first foundation in 1536, the second one in 1580. The first time the national flag was raised in 1812 at the constitution of Buenos Aires as the capital of the country in 1880. This monument is a meeting point to celebrate sports victories and a rally point for demonstrations. The second place we visited was Colon Theatre, one of the main lyric theatres of the world. The Theatre has a curious story: it was first unveiled in 1857 in front of Plaza de Mayo, but then closed in 1888 to turn into the national bank. The authorities, planned to build a new theatre and open it in 1892 but it wasn’t until 1908 that the new theatre was unveiled. Its main concert hall has a horseshoe shape and it is considered to have some of the best acoustics in the world. Besides, the theatre has an established cast, a dance group, orchestra, a library, a museum, and it has capacity for 4,242 spectators. Later that day we went to the Recoleta Cemetery, the first public cemetery of the city and, today, the most elegant and aristocratic one. In its almost six hectares, they lie national heroes, presidents, politicians, servicemen, artists and celebrities. For instance, the fist lady and political leader, Eva Perón, the writers Bioy Casares and Silvina Ocampo, the Nobel winning Federico Leloir and Saavedra Lamas and the presidents Sarmiento, Mitre and Yrigoyen. Many of the vaults of this cemetery were built by important architects and are decorated with sculptures. 90 of the vaults have been declared Historical National Monuments. Following the tour, we arrived to the MALBA, the Museum of Latin American Art of Buenos Aires. The building is covered with limestone and has large superficies made of glass and steel. Among many others, you can find the work of artist such as Frida Kahlo, Wifredo Lam, Roberto Matta and Antonio Berni. In the museum, there also is a cinema, a Café, a gift store and a bookstore. That afternoon, we also visited La manzana de las luces, a square that has some of the oldest constructions remaining in Buenos Aires. The name of this square refers to the educational and cultural institutions that are located at the Manzana for centuries, and it appeared in the first plans of Buenos Aires from 1580. In 1661 it was given to the Jesuits, who built a church, a school, a drugstore and the general office for their missions. The San Ignacio School, which opened in 1662, soon became a meeting point for all the intellectual citizens. However, in 1863, the government took charge of it and named it Colegio Nacional Buenos Aires. Today is one of the two most prestigious secondary schools of the city, with the "Escuela Carlos Pellegrini." In brief, Buenos Aires has plenty of cultural places to visit, such as: the Museo Nacional de Bellas Artes, the most important fine-arts museum of the country, which is among the principal museums of the world, and has the biggest collection existing of Argentine art, the Kavanagh Building, a skyscraper built by a millionaire who sold two of her farms to finance its construction, San Martín Theatre and Caminito, one of the favorite walks of tourists down the neighbourhood of Boca, covered by painting and sculptures. This street, is surrounded by houses typically from the area, all of them made of sheet walls and painted in all kinds of colours. At this street and surrounding it, there are street shows and a craft markets. Our last day in Buenos Aires was a lot much greener. 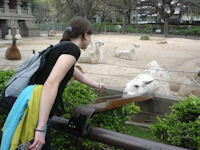 To begin with we visited the zoo, eighteen hetares of nature located in the heart of the city. We enjoyed the morning with the elephants, giraffes, different kinds of bears and lions. After that, we crossed the street and found ourselves at the Botanic Garden, which was designed by the French landscape gardener Thays. The garden has seven hetares and houses 6,000 vegetable species. It also has a botanic library, three stylish gardens (a French one, a Roman one and a Japanese one), a herbarium, five greenhouses and plenty of sculptures. After the Botanic Garden, we took the bus to visit the Natural Reserve, the biggest green space of Buenos Aires, containing hundred of species of flora and fauna. The paths of the reserve, that lead to the river, can be done walking or by bike and there is also a guided tour available. Finally, the last place we visit in Buenos Aires, was Costanera Sur. It is one of the most popular places of the city and people go there to ride a bike, jog or just spend a day in family. In 1928, its beaches were inaugurated and it soon became the most visited ones. Nevertheless, the place lost its importance since 1960, mainly because of the pollution of the river, which lead to the prohibition of swimming in its waters. All in all, the Costanera is very frequented at night and day, and especially during the weekend. There we met a group of Argentinian guys gathered there in a small circle, talking and drinking ‘mate’, a traditional infusion. They invited us to sit with them and we spent the most wonderful afternoon of our trip. 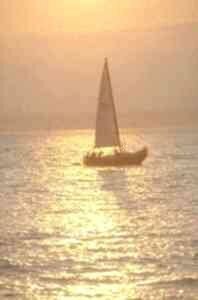 But, when the sun set, we had to take off. If you enjoyed reading the above article then you will probably also enjoy The Amazon, also in South America, and our latest articles covering the Orinoco Delta, La Mata, Marbella and Beijing.